Welcome to North Star Frozen Treats! Finally! Real Ice Cream- just without the lactose. Three flavors on one bar- it's never been done before like this, and with NO lactose, you can enjoy all the real dairy flavor and richness with not stomach distress. Go for it! It's cookies, it's ice cream, what could be better? Having them in one delicious treat! When you want more than just a scoop of ice cream, you want a sundae cone! Topped with your favorite crunch or nuts on a delicious waffle cone. ICE CREAM: MILKFAT AND NONFAT MILK, MALTODEXTRIN, POLYDEXTROSE, SORBITOL, MONO AND DIGLYCERIDES, CAROB BEAN GUM, CELLULOSE GUM, GUAR GUM, SUCRALOSE, CARRAGEENAN, ARTIFICIAL FLAVOR, VEGETABLE ANNATTO COLOR, VITAMIN A PALMITATE. 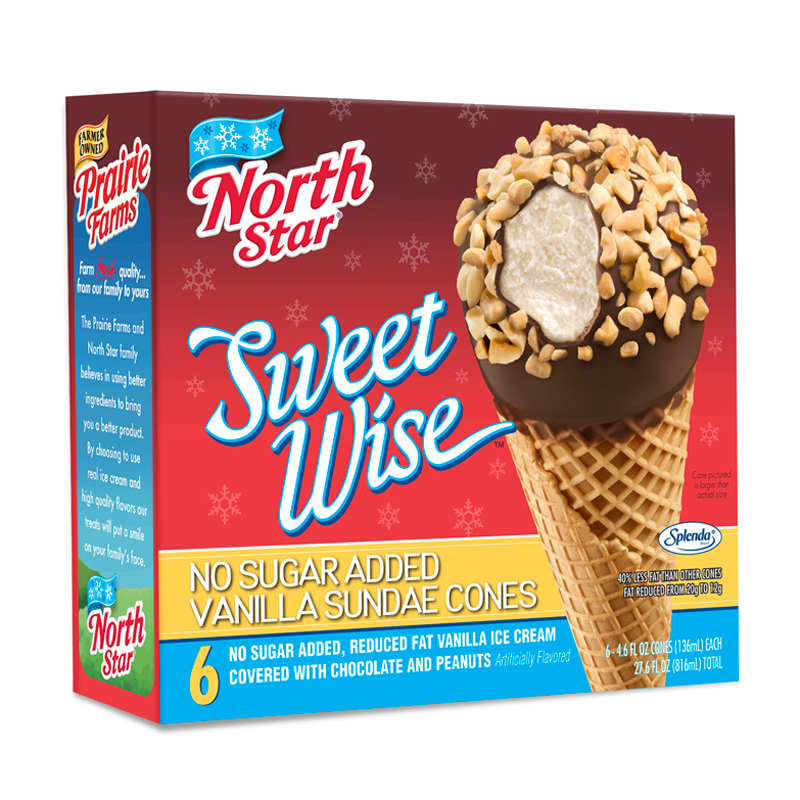 SUGAR CONE: BLEACHED WHEAT FLOUR, SORBITOL, POLYDEXTROSE, SOYBEAN OIL, PALM OIL, SALT, CARAMEL COLOR, SOY LECITHIN, ARTIFICIAL FLAVOR AND SUCRALOSE. CHOCOLATE COATING: COCONUT AND SOYBEAN OILS, MANNITOL, ALKALIZED COCOA, PARTIALLY HYDROGENATED PALM KERNEL OIL, CHOCOLATE LIQUOR, ERYTHRITOL, MALTITOL, SOY LECITHIN, NATURAL AND ARTIFICIAL FLAVOR, SUCRALOSE AND PEANUTS. Copyright © 2019 North Star Frozen Treats - A Division of Ice Cream Specialties. Part of the Prairie Farms family. All rights reserved. Enter your name and email for special members only monthly coupons... it's FREE! Yes! I want ice cream coupons! Your information will *never* be shared or sold to a 3rd party. Prairie Farms and North Star guarantee it!